… about thirty-five hundred years ago was a turning point for human civilization. The Canaanites designed an alphabet used to form words, rather than having a sign for each object. This extremely effective tool became available just in time for Moses to write the first books of the Bible. … is regarded as the most significant event in the last six hundred years. John Gutenberg invented movable type and printed the Bible about A.D. 1450-55. Since then printing presses have flooded the world with information. But the Bible remains the all-time bestseller. The Book of Books–The People’s Choice! Some people choose the Bible because, as time goes on, modern man repeatedly discovers Biblical data that were presumed false but are, in fact, scientifically sound. For example, three thousand years before Copernicus and Galileo declared the earth to be round, Old Testament prophets referred to it as round (Isaiah 40:22) and hanging in space (Job 26:7), and the sun as orbiting through space. Psalm 19:4-6. Present-day astronomy confirms that the sun travels in a huge, elongated circle. Other people value the Bible because they find its prophecies to be accurate. During the height of the “Cold War,” for example, students of Bible prophecy knew that nuclear warfare would not destroy the world. Again, during the 1991 Gulf War, they knew that that war was not Armageddon. 1. What else makes the Bible so beloved? “Before I formed you in the womb I knew you,” God said to Jeremiah and therefore to us as well. “Before you were born I sanctified you” (Jeremiah 1:5). Many books speak about God, but the Bible is God speaking to us. His Word reveals our divine origin and connects us with our Maker through His love. This sacred book is our user’s guide for life and gives us examples of what is effective and what is not. It provides spiritual food for every hungry soul as no other book does. 2. What is the grand theme of the Scriptures? “God demonstrates His own love toward us, in that while we were still sinners, Christ died for us” (Romans 5:8). The Bible is a revelation of God’s love for the human family and His plan to save people from the power of sin. 3. What is the Bible, and how did it come about? “Prophecy [the word of God] never came by the will of man, but holy men of God spoke as they were moved by the Holy Spirit” (2 Peter 1:21). 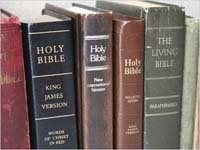 The Bible is a collection of sixty-six books written by thirty-five to forty inspired authors. This makes it a miniature library. Moses wrote Genesis about thirty-five hundred years ago. John wrote the last book (his gospel) about sixteen hundred years later. The authors lived under very different circum­stances and had a variety of occupations. Although most of them never met, their messages harmonize. 4. Why is the Bible referred to as the Holy Scriptures? “All Scripture is given by inspiration of God” (2 Timothy 3:16). To be inspired means to receive understanding and instruction through God’s Spirit. Because God is holy, whatever comes from Him is holy. 5. Why does the Holy Bible depict so much evil and violence? “All these things happened to them as examples, and they were written for our admonition.” “For whatever things were written before were written for our learning, that we through the patience and comfort of the Scriptures might have hope” (1 Corinthians 10:11; Romans 15:4). We cannot learn from fiction as we can from reality. While God “tells it like it is,” there are no lewd, disrespectful expressions in the Bible. It gives a short, simple, factual report of the history of His people. If the Bible reported only the good, we wouldn’t learn how to deal with evil. It is heartening to see how God loves sinners and helps them overcome sin. 6. What evidence do we have that the Old and the New Testaments really are God’s word? “We have also a more sure word of prophecy” (2 Peter 1:19 KJV). Peter and John were eyewitnesses of Jesus’ works of love and miracles for three and one-half years. But Peter pointed to a “more sure” source of evidence that everyone can investigate: the prophetic word. The fact that Biblical prophecies have been accurately fulfilled confirms the Bible’s reliability. 7. Are the teachings of the Old Testament outdated in New Testament times? “These are the words which I spoke to you while I was still with you, that all things must be fulfilled which were written in the Law of Moses and the Prophets and the Psalms concerning Me” (Luke 24:44). Christ and the apostles frequently quoted from the Old Testament because the lessons it contains are of eternal value. 8. Did Jesus say that any part of His Word would eventually become obsolete? Jesus said, “Heaven and earth will pass away, but My words will by no means pass away” (Matthew 24:35). His Word, the law of the universe, does not–indeed cannot–change. His love, His purposes, and His basic directions are also unchanged. 9. How does God help us understand Biblical themes? “But God has revealed them to us through His Spirit. For the Spirit searches all things, yes, the deep things of God” (1 Corinthians 2:10). We may ask God for the same divine Spirit who inspired the Scriptures to help us understand them. 10. How does God instruct us to study the Bible? “Search from the book of the Lord, and read: Not one of these shall fail; not one shall lack her mate. For My mouth has commanded it, and His Spirit has gathered them” (Isaiah 34:16). While we need to read passages in context, God also urges us to search the Scriptures by “comparing spiritual things with spiritual,” “here a little, and there a little” (1 Corinthians 2:13 KJV; Isaiah 28:10 KJV). Scripture is the key that unlocks Scripture. One verse explains another. As we prayerfully seek God’s guidance, His Spirit will help us gather the various components of a truth written by different Biblical authors and scattered throughout the Bible. A complete and clear picture of that subject will appear. 11. With what attitude should we approach the study of the Scriptures? “If any man will do His will, he shall know of the doctrine, whether it be of God, or whether I speak of Myself” (John 7:17 KJV). We may ask God to help us want to obey His Word so our minds don’t distort the Scriptures to fit our wayward desires. 12. Who else will help us understand the Scriptures? Jesus said to His followers: “Go ye therefore, and teach all nations … to observe all things whatsoever I have commanded you” (Matthew 28:19-20 KJV). The Bible was written and is now printed and distributed by people who love God. He wants people to teach one another. 13. With all the various teachings, how can we tell truth from error? “If they speak not according to this Word, it is because there is no light in them.” “[The Bereans] were more noble than those in Thessalonica, in that they received the Word with all readiness of mind, and searched the Scriptures daily, whether those things were so” (Isaiah 8:20; Acts 17:11-12 KJV). The Berean Jews were commended for giving Paul and Silas a fair hearing, then searching and comparing what was preached with what the Scriptures say. Familiarity with God’s Word helps us to separate the true from the false. 14. What will the Scriptures do for us? “All Scripture … is profitable for doctrine, for reproof, for correction, for instruction in righteousness, that the man of God may be complete, thoroughly equipped for every good work” (2 Timothy 3:16-17). The Book of Books connects us with the mind of God and shows us the way to eternal life. As we learn to live by the Word of God, it will gradually change us and fit us for life with God. And while the Bible is painfully truthful, it assures the reader that “the truth shall make you free” (John 8:32). • The Old Testament was written in the original Hebrew (very different from its modern counterpart). The New Testament was written in Aramaic and in ancient Greek. These languages are no longer spoken–they are “dead languages.” The Old Testament consists of thirty-nine books. Its last book was written four hundred years before Christ. • The New Testament consists of twenty-seven books, written approximately A.D. 50-100. All of the Old Testament books are quoted or referred to at least in part in the New Testament with the exception of the book of Esther. • All sixty-six Bible books, except the book of Esther, contain divine predictions. • A divine hand has guarded the Scriptures in the thirty-five hundred years of their existence. “The word of our God shall stand for ever” (Isaiah 40:8). • Punctuation was invented in 1490 by a Venetian printer and later inserted into the Bible according to the best understanding of the translators. • For easy reference, each book of the Bible is divided into chapters and verses. This was done in the sixteenth century. • Many Bibles have references. They function like footnotes except that the references are often found in the center margin. They often refer to other verses on the same subject for further study. • For more in-depth study, a Bible concordance has texts arranged by key words. Cruden’s concordances are very user friendly. Strong’s concordances include Hebrew and Greek dictionaries. These and other concordances can be purchased at all Christian and most secular bookstores. What about … THE VALUE OF THE BIBLE AS AN EDUCATOR? • How do we know that the modern Bible is the same as when the authors wrote it? The Masoretes were Jewish scholars who, down through the centuries, guarded and copied the Old Testament manuscripts. They had extremely strict rules to guard accuracy. The Dead Sea scrolls, discovered in the Qumran caves of the Judean desert in 1947-48, are for all practical purposes identical to the Masorete text, though they are a thousand years older. There are six thousand surviving manuscripts of the New Testament in Greek. Laymen in widely separated places conscientiously hand-copied these manuscripts. Essentially identical, these manuscripts form the basis of the English King James Version of 1611. • The Bible reports some terrible sins; should I keep these from my children? Parents do not have to read the Bible verbatim to young children but can adjust the Bible narratives to the children’s age levels and understanding. In “Our Search for God. Where Is He? Who Is He? What Is He Like?” (Lesson 4), we’ll see that God Himself answers man’s most profound questions. is God speaking to us. tells the truth as it is, in love. their getting together to decide what to write about. Hebrew and Greek theologians deleting all differences. the same divine Spirit inspiring each author. rely implicitly on the most customary and popular beliefs. compare different Bible passages, and let one verse explain another. asking God for guidance and wisdom through the Holy Spirit. a willingness to follow the instruction received. people who prefer the Spirit to the Holy Scriptures. people who read the Bible, listen to other people, and ask for the Holy Spirit’s guidance. 7. How can we know that professed teachers of His Word are sent by God? By studying Bible topics and comparing what is written with what the teachers say. 8. What does the Bible do for us, the readers? It tells us the truth. It acts as a user’s guide for living our lives. It changes us and makes us fit for eternal life.